Work continues on the CPR plywood sheathed car. Production casting starts this week. Etching artwork is done and the brass should be in hand next week. The running boards are being cut as we speak. I need to get a set of parts in hand so I can build the pilot model and write instructions. If not by Valentine's Day, soon after I'll be taking orders. Hope you're as excited as I am! Other projects move forward as well. The NP 39000 series of boxcars are coming along. Aaron just did a test cast to check out the pattern and what if anything he's missed. The underframe is 75% there as are the other bits required. I'm hoping by mid-summer for release. 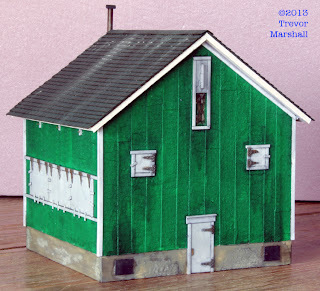 Another result of the work session on Saturday past, was a decision about part of the station scene in Aylmer. 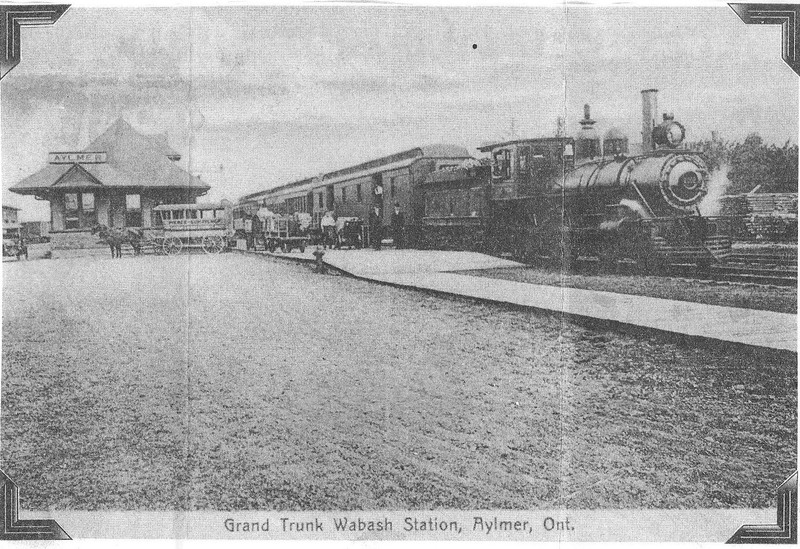 As I've blogged earlier, http://elgincarshops.blogspot.ca/2012/05/bit-of-mystery.html, the actual date for the destruction of the Aylmer station still remains a mystery. I'm getting closer, in that I've eliminated some options. I've gone through the Fire Hall minutes book as far back as the beginning of WWII. That's Sept '39 for those of us who aren't in the US. And there's no record of a fire. I'm now thinking that perhaps a fire occurred during the depression. With times being tough I can see the railroad not wanting to spend cash on a new structure, rather less money to move the train order board adjacent the elevated crossing tower and passenger ticket sales, such as it was, to the freight shed just to the south of the original station. It's worth noting that it was during the '30s that a daily mixed from St Thomas to Glencoe was canceled, most likely due to lack of passengers. It certainly was a lovely looking station. And in the '20s an express extension was added to the west end, the other side of this view. So regardless of the actual date of destruction, I've decided to model the footings. In spite of the likely hood that the footings would have been dug up by the timeframe I'm modeling, 1951. It may not be 100% accurate, but as Trevor said, " it helps tell the story." And it's a little different, but not beyond the realm of possibility. However this scene is not fanciful. I have it on good authority, a retired Wabash engineer, that orders were indeed hooped from the crossing tower and that the operator worked from here. Aylmer was a 24 hour train order station. And the 1948 survey map shows the train order board in this location. If you go to this location today, you can still see the rails in the ground that made up part of the support for this structure. So a few of the guys were over Saturday to help me make progress on the layout. Tradition dictates that they arrive mid-morning, get projects underway. We go out to lunch. Get more work done and then my lovely wife, Kate, cooks an awesome meal. Everybody's on the way home by 8:00 pm. Sadly absent was our late friend Rich Chrysler. Still getting used to his absence. Brian was tasked with finishing up the terrain around the coal plant in Aylmer. With that done I can now build the leanto over the unloading ramp and call the dock done. Well almost, still have to add ladders. John M was given a pile of DPM parts, a photo, a knife and a little direction and the corner of the milk condensing plant in Aylmer has started to take shape. And it's worth noting that John did not spill the glue on this day. Trevor was given the big knife and let loose with the styrofoam. Almost all the benchwork voids are now covered with foam ready for further scenery work. This is also the location where the tobacco kilns and a number of Busch tobacco plants will go on the lower level. Dylan, being the youngest and thus the spriest, was sent into the"pit" to lay the track for what will represent the south end of the Hagersville sub. One turnout and Tortoise machine and a few lengths of flex. A stationary decoder and some wiring. It all works. And John S. stood just the other side of the benchwork from Dylan and when he wasn't passing tools to Dylan, he finished the east end staging yard, as well as another 2 track staging for the north end of the Hagersville Sub. Sadly absent, due to a family illness was Mark H. I think I have to stop inviting him to the house. Almost every time I plan a session and invite him, something goes wrong in his life. I'm starting to take it personally. I don't know where I'd be without these guys and their help. I had a few of the gang over yesterday to work on the layout. More on that later. My good friend, Trevor Marshall was in attendance, bringing his usual offbeat sense of humour and his myriad of modeling talents. And a little treat for me. He had in his hand an HO scale model of a tobacco kiln he'd scratchbuilt for me to use on my layout. The plan is actually to 5 of these, side by each, just outside of Delhi. This morning, I was thinking about the previous days accomplishments and was struck by something. This hobby of ours is somewhat unique. Much of what we do in our basements, attics, garages, spare rooms, etc, are solitary pursuits. I've no doubt that most if not all of our significant others, at one time or another, complain about the amount of time we spend in our miniature worlds. And yet, as yesterday's accomplishments demonstrate, we would accomplish far less without the input and assistance of others. Whether it be friends coming over to help build the layout and eventually run the thing, or strangers on the internet sharing data and ideas that help us over the hurdles we put in front of our selves, we are indebted to the myriad of people who have helped us along the way. Model Railroading may be fun, but the camaraderie is really what makes it work for me. Got back on Sunday from Prototype Rails in Cocoa Beach. Good times, good people. Thanks to Mike Brock for hosting this event. It's well worth the trip. I acquired a couple of things while there. I received the first production body casting of the CPR plywood sheathed car I'm working on. Looking good! We've had a few delays due to illness and other issues, but the target date for release is still February for now. 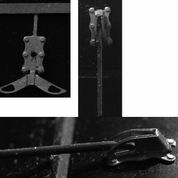 The holdup now is artwork for etchings and laser cutting. But it will be worth the wait. The other item I picked up was the last Smoky Mountain Model Works HO scale kit. 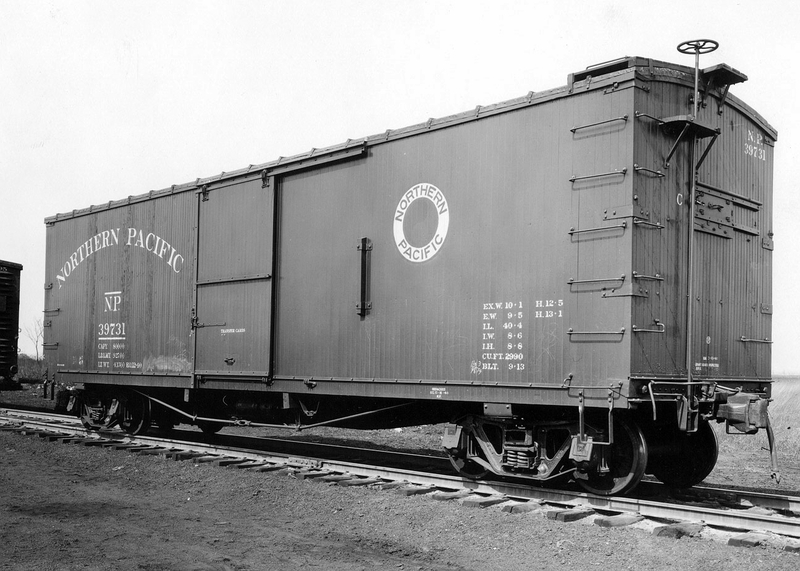 An SAL B7 turtle roof boxcar kit. I was very impressed with the effort that has gone into this car. I wasn't going to buy one of these, since the online photos I was seeing weren't that impressive. But once I got to see the body casting in person, I was sold. The website photos do not do this model justice. The biggest concern I had was the roof/end interface and I have to say that the model deserves a 9.5 out of 10. The flange should be thinner, but I doubt that it would have been practical to execute the pattern otherwise. So am I going back to Cocoa Beach? You bet I will! Maybe next time there will be a launch from NASA to really ice the cake. Actually I blanked on that one. Insert your own adjective. I just completed these 2 S scale freight cars for my friend, Trevor Marshall, who's building a layout of the CNR Port Rowan branchline. I've had the great pleasure of running on his layout. Trevor subscribes to the "Slow it down" school of operations. Check out his blog and see what he's up to. Some neat ideas. Back to the cars. The gon is a F&C offering, and while a fairly straight forward build, it certainly helps give one a sense of the possibilities of S scale. 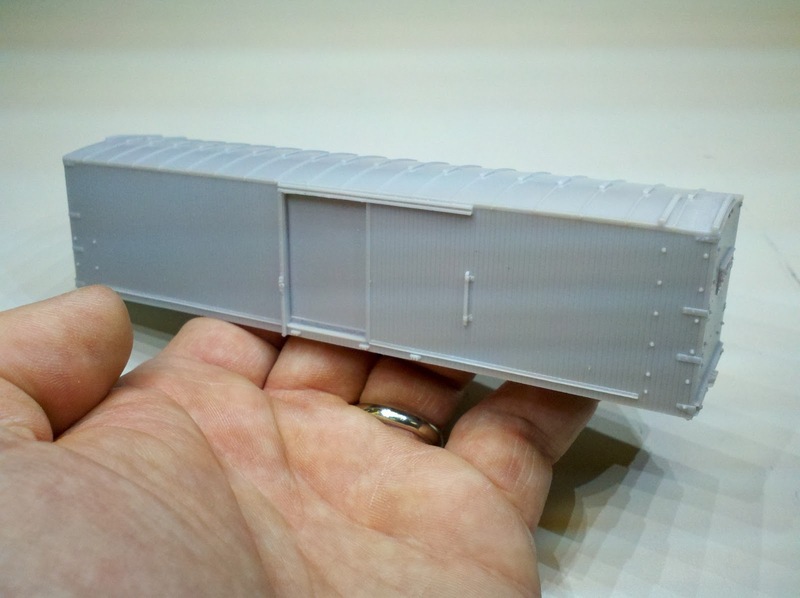 The ventilated boxcar is a Smokey Mountain Model Works offering. A very nicely done kit, that is a delight to build. 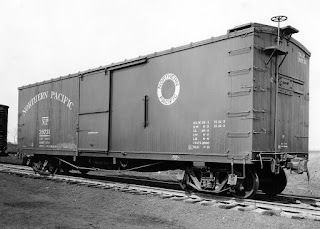 I do enjoy ventilated boxcars. They are just so darn neat. The double set of doors and the end vents create a unique looking car. And they wandered all over the place, hauling melons and other such produce. Most transition era layouts should have at least one on the roster. In 2 days it's off to Florida for the Prototype Rails meet. First time for me at this meet. In fact first time for me that far south. The fact that it takes model trains to get me to Florida in the winter is instructive. Draw your own conclusions.